In general, I don't trust myself to describe cigar flavors with the proper words. So, I'll keep it simple. . It's not that I don't feel like I taste everything that most everybody else does but, I just don't translate specifics into words like leather, or woody, however, I'll try and be as forthcoming as I can. 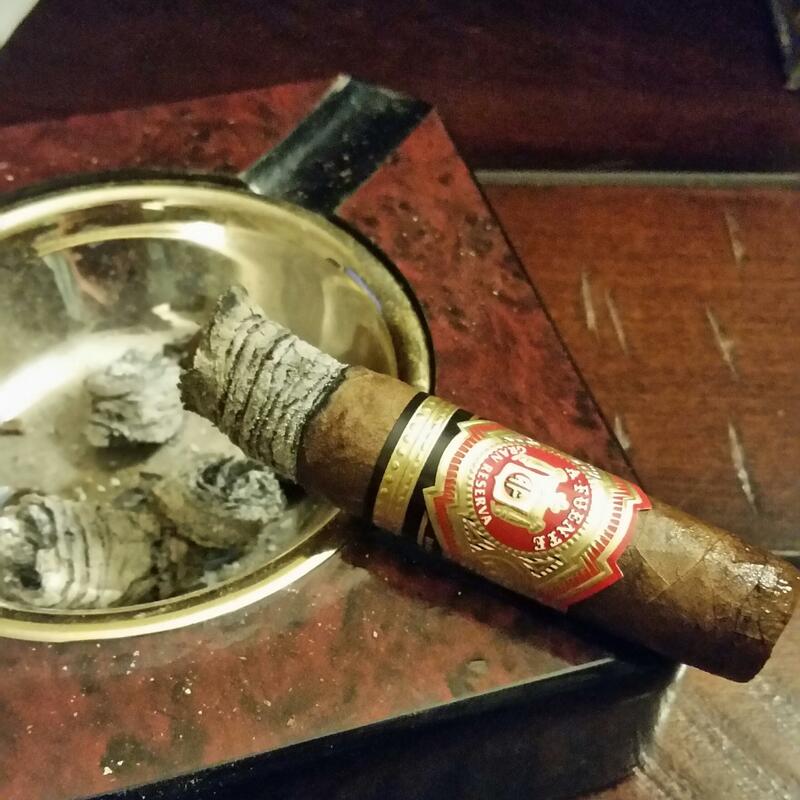 As for this cigar on this night, The burn was not perfect, which is unusual from my experience with hemmingways. I would call this a medium strength and a medium to medium-full body. Very mellow, easy retro, sweet and earthy. Hows that? Plus, every hemmingway I've ever had I've liked. I'd hand this cigar to anybody. Even a first time cigar smoker. It's likely that with a hemmingway Cameroon, they'll be hooked form the experience of quality from their first "real" cigar. I believe I have one left from a box my dad bought me as a bachelor's party gift just over 3 years ago. Should be good! Great summary, Bob. If I could only smoke one brand for the rest of my life, it would probably be a Hemingway. 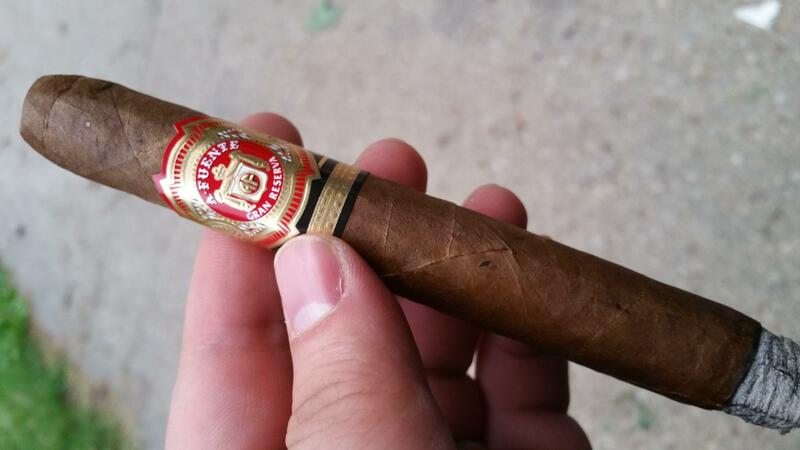 I've smoked Opus X , God of Fire and Anejos and none of these Fuentes comes anywhere close to the satisfaction that Hemingways deliver time after time. Whenever I suffer through an "overhyped" cigar that makes me want to give up this hobby forever, it's almost a follow-up Hemingway that reels me back in. I tend to prefer the smaller sizes--the Work of Art, Best Seller and even the little "Short Story." As fine as the filler is, to me the sweetness of the Cameroon wrapper in the smaller ring gauges is what makes the difference. I don't think they would nearly as good in a larger gauge. The Maduros are excellent as well. A taste of the cap is slightly sweet it reminds me of the honey glaze on some pastry's, used a 9mm punch on this one the draw is very firm with a cedar taste. toast with a single flame torch. The tip has the same sweetness I got from the dry draw, as it burns into the main body there is a spicy cedar that I like and the draw has loosened up and is just right. The 2nd 3rd brings out some wood notes as well as a musty, earthy taste that works well with the cedar. Going into the finial 3rd I start to get a slightly bitter, acidic taste and dry mouth that I tend to associate with some of the Fuente Cameroons although after two years rest it's not as strong and the flavor still comes thu, sort of a caramelized spice. The burn never got uneven enough to consider a touch up. I was not very impressed with these when I bought them but I feel that the rest this cigar had did wonders for it. I just got a 5'er of the Signatures today and am planning on having one for the review on Sunday. I'm wanting it to well, and even though I'm sure a couple years will do wonders, I really want it to shine NOW. Oh, wow, maybe have to dig out a short story tonight. Wish I had some in maddy; they're yummers beyond even the regular in my book. Still, a great smoke. A tasty smoke, delicious flavor (cocoa & cedar & pepper) and perfect draw. Ash fell 1x, No touch ups needed. Took this little beauty to the nub, toothpicked it even farther and felt like I was saying goodbye to a friend at the end. This is a must have in my book: at under six bucks a stick, it will remain in my rotation. Where are the pics? The Signature is top 3 for me. Lots of good descriptions fellas. Anyone want to smoke a Hemmingway on Vherf tomorrow? I'll be on after dinner. I think it would be fun. Good point Ryan... why no pics? Funny you say that. I smoked the Hemingway Classic last night while the kids where outside playing. 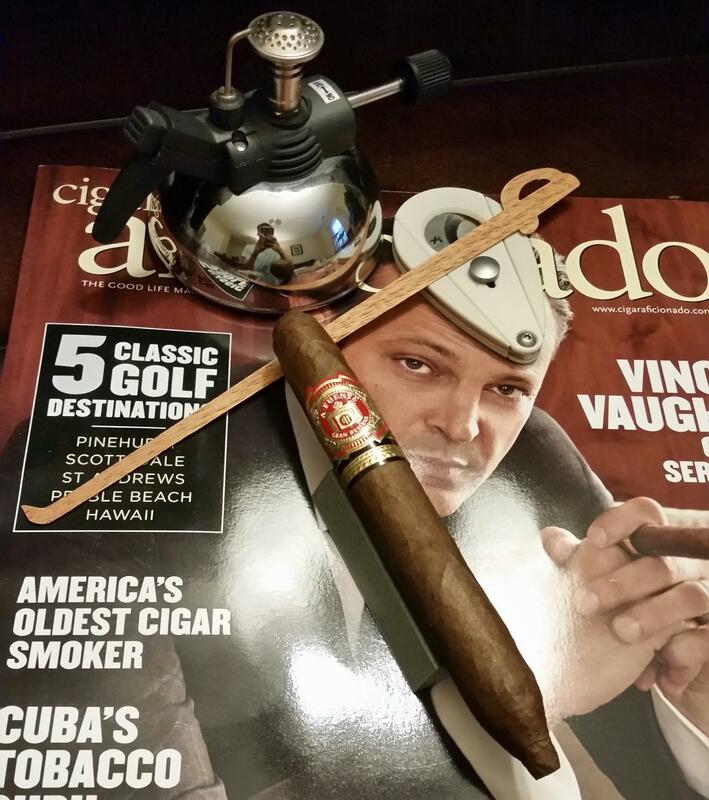 Its been a short minute since I have had a Hemingway but was excited to smoke one tonight. My attention was somewhat diverted as I was having to watch/play with the kids at the same time. My favorite part about these is that sweet flavor you get off the Cameroon wrapper and then I also get a long lasting finish off of these that will linger for awhile which really makes it enjoyable. From what I was able to focus on I picked up the touch of cocoa but mostly for me I get that sweet cream, very slight spice and some woody leather. I smoked this down to about 2" left and I was disappointed I had to put it out but when a kid falls off their bike and tears up their knee I had to tend to that. These are always a great consistent smoke and 1 of the first sticks that really got me interested in cigars. 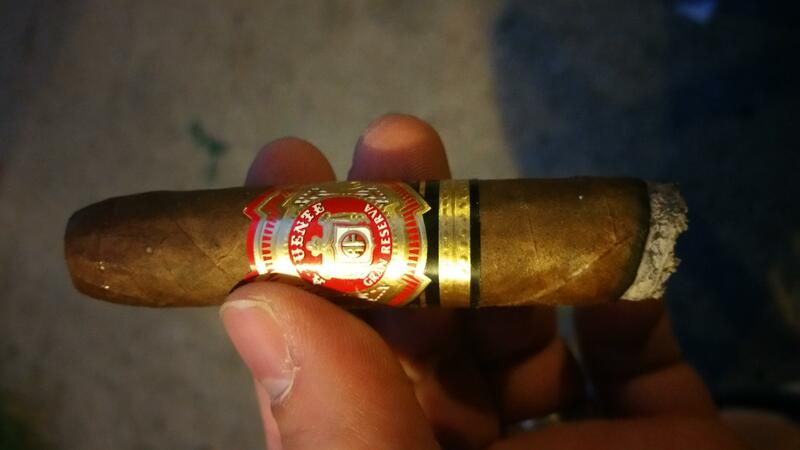 AF Hemingway with a little over 3 years in my humidor. Vince looks on approvingly. I recall a little more cinnamon or slight baking spice in these, but this one seems to have a lot more cedar notes. The first half is very smooth, yet I'm missing some of the (baking) spice and cocoa. The second half picks up a lot and the profile really rounds out. Still seems predominantly woody, but is not dry or bitter at all. There is a very smooth finish with a nice vanilla note that sits on the back of the tongue. Burn is perfect and ash clings on tight. I think this thing you guys are doing is very cool, especially since you picked my all time favorite affordable cigar. Very enjoyable read, I hope you keep this up. I had the Signature this afternoon - Brown delivered it Tues. I was very pleased that it did as well as it did, being new. The first third had a pleasant sweet, fruit-like flavor with a bit of an edge or sharpness in the retrohale and aftertaste, that became more of a sweet wood/leather flavor in the second third, with the edge/sharpness continuing but not in a completely distracting way. The final third kept the wood/leather minus the sweet, and the harshness stepped up a notch. Overall, a fine experience, and I fully expect any of the negatives will dissipate with age. Speaking of Hemingways, y'all probably got an email today from c.com with a deal for Maduros--but last year I got my box of Best Sellers for $10 less including shipping by yammering my rep.